Nicole joined Common Ground in early 2018. She provides social media, copywriting, and media relations counsel to a variety of agency clients. 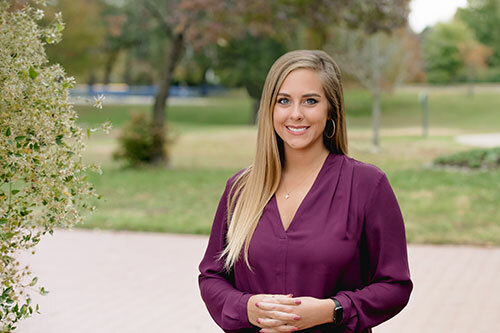 In college, Nicole was a member of the Public Relations Student Society of America, the National Society for Collegiate Scholars, Kappa Delta Sorority, Kappa Tau Alpha National Honor Society, and Order of Omega Greek Honor Society. She also worked as an advertisement designer at the Murray State News. She previously served Make-A-Wish® Missouri as a marketing intern, where she wrote marketing plans, updated underdeveloped programs, and planned events to celebrate major Make-A-Wish® milestones. She enjoyed the creative freedom and loved working for an organization that gave so much to others. Nicole earned a Bachelor of Public Relations from Murray State University in Murray, Kentucky, as well as a minor in marketing.